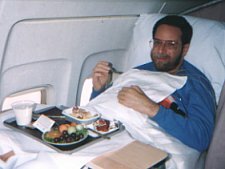 One of the best options we have for international repatriation flights is the airline stretcher option. 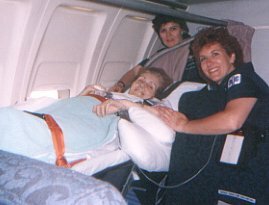 This service is provided with a properly secured stretcher on an safe international airline, with supplemental oxygen and the specialized portable medical equipment provided by ATS. As the aircraft are larger and fly longer distances without refueling, the transport is often times much faster and smoother on the patient. These stretcher services and specialized equipment we provide are comparable to a private air ambulance aircraft in scope and capability. Commercial stretcher flights offer an alternative to the high cost normally associated with private air ambulance service transports over long distances internationally. The price of this service ranges from the purchase of four, full-fare, first-class seats to nine coach seats. International carriers have varying degrees of charges related to oxygen requirements. Although this may sound expensive, it is usually 1/2 to 1/3 the cost of a private air ambulance aircraft. The longer the distance, the more "cost-effective" it becomes. Each flight is staffed with two aeromedical crew members that are advance life support equipped. "Critical" patients including ventilator dependant patients are transported with complete battery support systems and all necessary back-ups. We utilize a special break-a-way stretcher system to assist with the enplaning and deplaning and coordinate all details to ensure the smoothest flight possible. ATS has the experience of safely transporting patients to or from over 90 countries in the world. 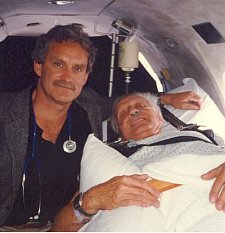 International repatriations are the most challenging and rewarding medical flights that ATS conducts. Communication with discharging facilities, medical practices, visa requirements and local customs are issues that must be overcome to ensure the successful transport of the sick or critically injured. Our office in Washington D.C. allows quick access to foreign embassies to expedite retrieval efforts and we are listed as a commerical resource with the US State Department. As a result, many times each year, we are called upon to transport loved ones back to waiting families overseas. A privacy curtain and special handling serves to ensure a safe and efficient transport without compromising the patient's medical condition or personal dignity.